Obama: "Be Afraid! Be Very Afraid!" speaks mountains. BE AFRAID, BE VERY, VERY AFRAID!! wanted to share with you what happened. is the commander here at Bagram. him and our great country. I went to snopes.com (it took me all of 5 seconds) and saw- as I suspected- that the letter was fake. 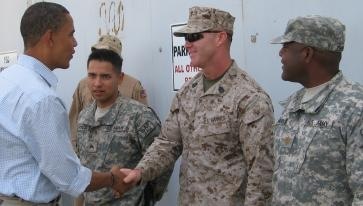 An Army spokesperson, in fact, stated that the tour was delayed because Obama took so much time meeting the troops. Truth seems to matter less and less. It is what “I believe” that is important, and facts seem to be secondary to that sacredly-spoken tenet. We all need to call each other out when we use “I believe” as a preface to personal opinion to which we demand capitulation by others. “I believe” does not always precede a truthful, logical, or even a civil statement. It is jargon which we use in expectation that others will not, cannot, dare not argue with us. Nonsense, I say! “I believe” should not be a free pass into obfuscation or the perpetuation of lovingly held personal opinions based on whims and culture. Needless to say, I’m going to be writing some more about Credo statements. Because it’s time for some of them to knocked down. Call it a vacation, a sabbatical, a semi-retirement. But I’ve got to stop for awhile. I’ll iPhone some small things in for awhile so you know I’m still breathing somewhere! Slowly, the meetings have begun to be scheduled again- some of the same meetings I intentionally withdrew from last Fall. These are meetings that are necessary, despite my laissez-faire attitude about getting things done over a phone call or two and a lunch. Not everyone works that way, and it is flat-out wrong of me to try to squeeze everyone else into little molds of me! So, there has been a few additions to the numbers of meetings I attend. I don’t like that, but so be it. The main thing I do it seems- each day now- is look for mom’s hearing aid (metaphorically speaking). I do that because I think the easier I can make it on the staff where she lives, the longer she will be able to stay there. I am trying, in a ridiculous way I know, to fill in a little of what she has lost through Alzheimer’s and.. The alternative to where she is now is more expensive, more distant, and it won’t afford the window views onto fields and trees which mom now is able to enjoy. If she has to move, I will probably have to move, too. And I don’t want to do that, not right now anyway. Sounds harsh, doesn’t it? But ask the caregivers of Alzheimer’s patients if it is not also true- that their loved ones became human husks before they finally and mercifully died. If I sound FUBAR lately, and I know I do..well, now you know. FUBAR and his sidekick, Irrelevant. I know those are both self-perceptions born of ego, too much thinking, and a summer surge of depression, but they overwhelm me right here and right now. I’ve lost the ‘me’ within the ‘I’. Dancing- Where the hell is Matt? Here’s one of those Internet gems. This one is being passed around in huge numbers- and deserves to be! Try to define what it is you’re seeing. Try to put in words why this video makes you feel happy and why you’ll probably be watching it again right away. It’s difficult, isn’t it? There is a community of the spirit. Join it, and feel the delight of walking in the noisy street, and being the noise. We are seeing people here of all ages and nationalities being the noise. And note how similar the “noise” looks and feels wherever it is happening! Go ahead, watch it again now. “I am he as you are he as you are me and we are all together” (The Beatles). That’s yet another way of saying it..
Here’s the Where the hell is Matt webpage. It’s fun. And noisy. My Poetry Awards begin to roll in..
Special Announcement for all you nay-sayers, doubters, and s0-called critics! See??? I was right! I knew my poem Kitty, Kitty, Kitty was worthy of real acclaim. These people- Poetry.com– know good poetry when they see good poetry. After all, they have a website dedicated to finding metaphorical wheat among the literal chaff that thousands of would-be but woefully untalented bumpkins submit to them every day. The Real Thing stands apart from the riff-raffian attempts of pretend poets- and Kitty, Kitty, Kitty is the Real Thing! Thank you, Howard Ely. You are a great man- the kind of man women dream about and the kind of man other men want to be. I humbly accept my ranking as one of your companions in composition- one of your poetic peers. Recently, I was delighted to inform you that your poetry merited an invitation to participate in The Best Poems and Poets of 2007. Because your work displayed an original perspective and unique creativity, judged to be the qualities found most in exceptional poetry, we wanted to include you in this select group of poets. Congratulations on your achievement! Commemorate Your Inclusion In This Exclusive Collection! To be selected as one of the Best Poets of 2007 is a truly remarkable achievement. Your work is included in the same discussion as the greatest poets of our time, and you should be extremely proud of this accomplishment. We are offering a limited edition certificate plaque that commemorates your poetic milestone. This exclusive certificate is beautifully typeset on archive quality vellum and mounted on a walnut-finish plaque under Lucite. These 10 1/2-inch by 13-inch plaques are truly impressive ways to exhibit your poetic achievement. We hope that you will take advantage of this limited-time opportunity. Act now and commemorate your achievement with a beautiful plaque that you can proudly display for all to see! Again, congratulations on being named one of the Best Poets of 2007! If I lost it today, I would curse, get in the car, and head for the nearest Apple store to buy a new one. Now, I learn, I can easily post blog entries from it, too! This is the first one so posted. Prepare to be overwhelmed with minutia. that is being said about it that day. and be better people for having done so. Where are we going for lunch today? and trickle down to her top lip.